Made with butterscotch pudding mix, these cookies are pure scrumptiousness. Then we made them more so—with chopped white chocolate and toffee bits! Mix flour, dry pudding mix and baking soda until blended. Beat butter, sugars and vanilla in large bowl with mixer until light and fluffy. Blend in eggs. Gradually add flour mixture, beating well after each addition. Stir in remaining ingredients. Bake 10 to 12 min. or until edges are lightly browned. Cool on baking sheet 1 min. Remove to wire racks; cool completely. Prepare dough as directed; press onto bottom of 13x9-inch pan sprayed with cooking spray. Bake in 375°F oven 20 to 25 min. or until edges are lightly browned. Cool before cutting into bars. Makes 24 servings, 1 bar (51 g) each. 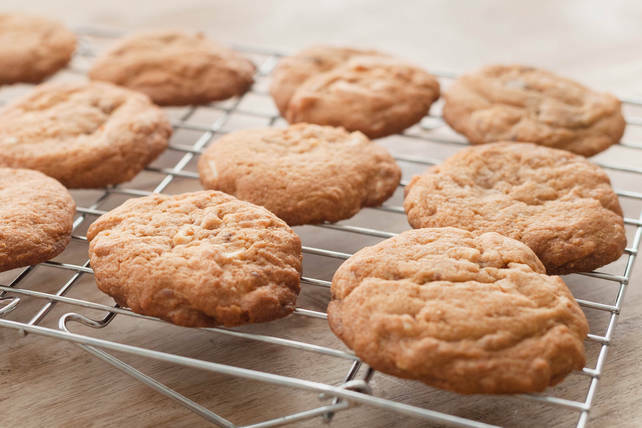 If baking these cookies in high-altitude areas, increase the baking time to 9 to 11 min. or until edges are lightly browned.